As the excitement from the engagement begins to settle, the time comes to really start thinking about your wedding plans. Some of us have dreamt of the perfect wedding since childhood, while others plan on the fly. Either way, it’s only natural to suddenly feel overwhelmed by the mountain of details that come with wedding planning. That’s okay. Allow yourself some time to come to grips what comes ahead. But before you stress out too much, remember that with just a few actionable to-dos you’re sure to start planning on the right foot. So get comfortable, invite your partner to join in (always! ), and get ready to plan the best day of your lives. For better or for worse, your wedding plans hinge on the amount of money you’re willing and able to spend. If you haven’t already, sit with your partner and have a difficult, enlightening, and necessary conversation regarding finances. 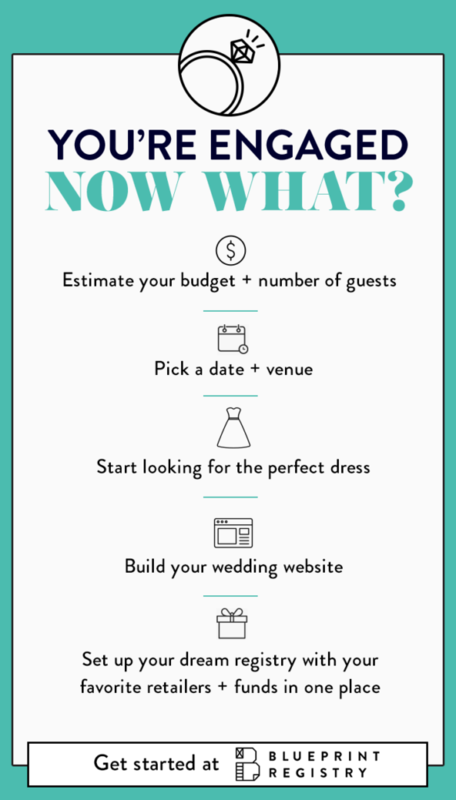 This is the only way to get some clarity on your wedding budget, and then you can start making decisions regarding all the other planning components. Believe it or not, some couples have taken to crowdsourcing their weddings in lieu of a traditional registry. If you have loved ones who’ve asked how they can pitch in and help with your budget, it could be a great idea to create a Blueprint registry to help fund your wedding. Still, it’s important to remember to stay within your means, because there’s never any telling how much or how many contributions you’ll receive. Also remember that whoever contributes to your wedding financially, should get some wiggle room to invite guests to the big day. After determining budget, we recommend putting together your ultimate guest list and start narrowing it down. Having an estimate of budget and guests attending will help narrow things down for when you start looking for a venue. Now that you know around how much you can spend, and about how many people you’ll be hosting, you can start looking at venues. Beginning this part of the journey often begs the question, however—do you find a venue or pick the date (or season) first? The answer? It depends! Unless you have a special date in mind (an anniversary, a holiday, etc. 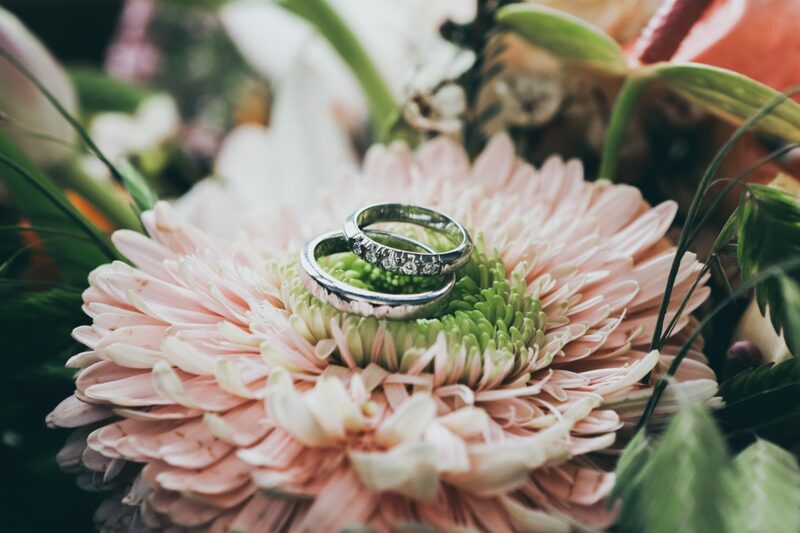 ), we recommend first picking a season to get hitched, then browsing venues to suit that season, and pick your wedding date depending on your venue’s availability. Some venues offer packages that include catering, cake, music, invitations, and more. When you nail down a venue like this, it can help open the doors to exploring other aspects of your wedding at the same time. If you’re opting for a backyard, park, or another affordable wedding venue, make sure you weigh cost estimates for catering, party rentals, music, and more. It’s also important to remember that a wedding at a popular venue will have a heavier hand in deciding on a date. A simpler backyard wedding, for example, leaves the door open for whichever date your heart desires. Bridesmaids and groomsmen can be your rocks throughout the wedding planning process. They’re people you care about, trust, and would be willing to be your sounding board. When someone agrees to being a bridesmaid or groomsman, this should be the understanding at a minimum. However, there are other things to consider when deciding on accepting the duties of either. The people you choose to stand by you on your big day is easy for some, and seemingly impossible for others. You should always consider whether you think a bridesmaid or groomsman is up for the task. There are many financial, time, and emotional commitments that not everyone would be game for. You know your people best. Choose people you can trust and that are up for the duties and responsibilities that come along with the position. It’s not for everyone, and that’s okay! And now for one of the most exciting parts of wedding planning—deciding what you’re going to wear! It’s important to note that finding the perfect wedding attire isn’t always as simple as strolling into a store, picking an outfit, and putting it away until the big day. Choosing a dress, tux, or even non-traditional attire should be done with a clear mind, full heart, and with plenty of time. Bridal tailoring can take several months, and unless you’re willing to pay a pretty penny for rush tailoring, make sure you give them the time they need. We recommend beginning your search towards the beginning of your wedding planning, giving at least 6 months before the wedding for all necessary alterations and changes. Remember to earmark a specific attire budget, and do your best to only look at pieces that are within your budget. The last thing you want is to fall in love with something you won’t be able to comfortably afford. There are so many affordable dress options out there, and there’s no reason to spend an arm and a leg. Before you go shopping, keep in mind that you’ll be required to put a down payment on the dress, usually around 50% of the total cost. It’s also a helpful idea to do research beforehand and to come into your appointments with some visuals to help your salesperson choose options that suit your tastes. Take the season, venue location, theme, and overall vibe of your wedding day into consideration when choosing your attire. Remember that you’ll be sitting, standing, dancing, eating, and drinking—all while trying to look your best. Find something that you love, that is comfortable, and won’t give you too many issues throughout the day. Something that’s too tight, or requires lots of maintenance could put a damper on your whole day. One of the benefits of living in the digital age is being able to publish a website in minutes, and turn the traditional wedding registry process on its head. Couples are including custom wedding website URLs on their wedding invitations, managing their RSVPs, seating charts, and registry digitally. The times have sure changed! A wedding website is the perfect way to not only showcase your love story and upcoming nuptials with the world. It’s also a one-stop-shop for guests to view information about your wedding events, figure out what to wear, and confirm their RSVPs all in one place. It’s perfectly within etiquette to list your wedding website URL on your wedding invitations, so guests can quickly and easily RSVP to your big day. Universal registries like Blueprint have completely changed the way couples build their dream wishlists. Couples no longer have to wade through stores with a scanner gun, and guests don’t have to print long wishlists and hunt down gifts. Nearlyweds don’t even need to register for physical gifts if they don’t want to. With Blueprint, you can build your dream registry—whether it’s physical gifts, cash gifts, experiences, or anything in between. Shop room-by-room in your home in our curated catalog (don’t forget those forgotten spaces! ), or add gifts from any online website with the Blueprint Button for Chrome. But before the fun stuff, sit down with your partner and discuss your wants and needs to determine the kind of registry you want to build. And if you need a little inspiration and guidance, we’ve got plenty of how-tos and sample registries to get you started. Don’t allow yourself to get immediately flustered by the mountain of wedding planning details. Start with the five steps below and the road ahead will gradually make itself more clear. By starting early, establishing a plan, and understanding what it all takes, you’re sure to knock your wedding day out of the park.